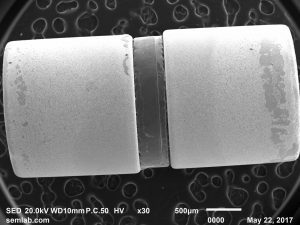 This is a BSE SEM image of a glass rectifier diode that was chemically decapsulated to remove the glass case. This is the diode die, which showed two separate breakdown sites that likely occurred simultaneously. 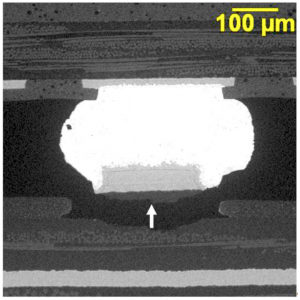 The die fractures are due to thermal shock due to the thermal effect rapid quenching by the surrounding die material immediately after the event. This type of breakdown is likely due to a fast voltage transient. BGA warpage can cause a condition called “pad cratering”. This condition occurs when the assembly cools down below the solidus temperature after reflow soldering and the solder joint is put under tensile loading that exceeds the cohesive strength of the PWB laminate. The condition often leads to open circuit failures that affect assembly yields. 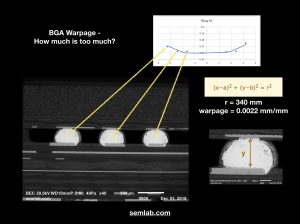 Calculating warpage based on measurements from BGA microsections. 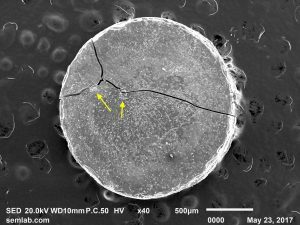 The terms microsections and cross-sections and metallography all refer to essentially the same process, which has been in use for a very long time. This metallurgist was first involved in preparation of metallurgical sections in 1979 while working as a Project Engineer for Northwest Technical Industries, which is now PA&E’s Bonded Metals Division. Metallographic cross-sections such as the one shown in Fig. A were prepared using standard metallographic practices to document the “wave pattern” and other features of the explosively bonded material. The same standard metallographic practices are used to microsection electronic components, printed wiring boards, solder joints, etc., which are typically combinations of metallic, ceramic, and polymeric materials. Some examples are shown below. 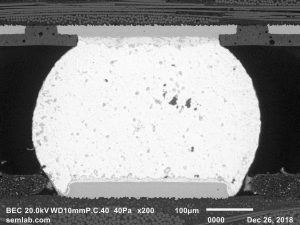 BSE SEM image of a microsection of an LED. Microsection of a multilayer printed circuit board. 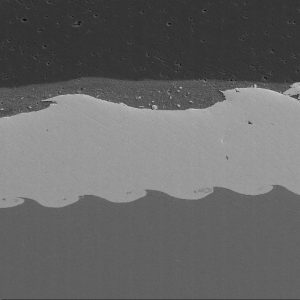 Microsection of a solder joint showing thermal fatigue failure. 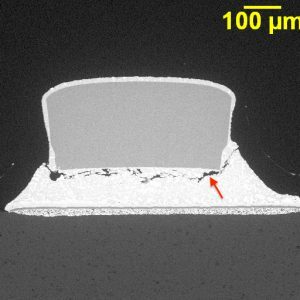 Preparation of microsections is more difficult for combinations of soft materials (metal & polymers) and hard materials (ceramic & semiconductors) because the soft materials polish at a faster rate than the harder materials. Nevertheless, it is worth the effort because root cause failure analysis often requires examination of microscopic material details such as microstructure, grain size, porosity, deformation, etc. that would be difficult or impossible to examine using other techniques. 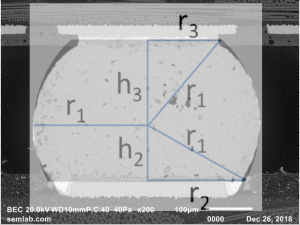 Measurements of solder joint height in microsections can be used to calculate the degree of thermal-mechanical warpage in a BGA assembly as illustrated below. In the previous two decades, black-pad-syndrome was a leading cause of intermittent BGA electrical failure. In 2018, this seems to have been replaced by head-in-pillow defect. 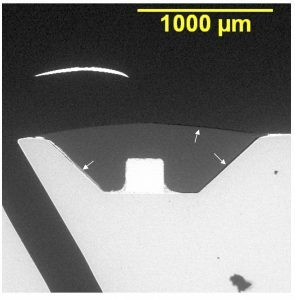 Both of these conditions generally require microsection analysis for a conclusive diagnosis as non-destructive techniques mostly fail to identify a problem. 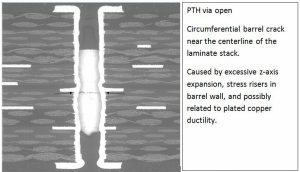 Here are some examples of head-in-pillow defect analyzed at SEM Lab, Inc. This condition is primarily caused by thermal-mechanical warpage of the BGA during the solder reflow process. Some corrective action recommendations can be found in . SMT Troubleshooting Guide, “BGA Head-on-Pillow”, www.alpha.cooksonelectronics.com, Issued 10/08, p. 17. A Dual Operational Amplifier IC was submitted for failure analysis. This is an optical image of the device. This is a BSE SEM image of the device after chemical decapsulation. This is a higher magnification image of the device die. This is electrical over-stress damage associated with an output, OUT2. This is an elemental dot map that shows aluminum exposed through the passivation layer in the damaged areas. The analysis results suggested that the device failed on OUT2 due to a high voltage transient event on the OUT2 signal. A client provided several PCBAs for failure analysis of out-of-tolerance MELF resistors. This is an optical image of a typical failed resistor showing localized delamination of the protective coating from the Tantalum thick film resistor material and Sn-Pb particles trapped at the interface. This is a high magnification optical image of a Sn-Pb particle as-viewed through the outer coating that bridged the laser cut causing a short. This elemental spectrum shows that the short is a Sn-Pb particle (sample particle as in previous image). 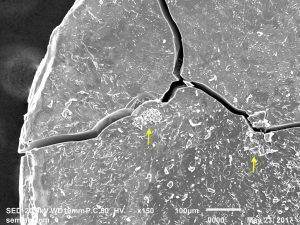 Sn-Pb particles were found in microsections sitting on top of the Tantalum thick film resistor material under ~ 40 microns of outer coating. The root cause of the failures was tramp metal (Sn-Pb) contamination under the coating suggesting inattention to cleanliness in the manufacturing environment. I am left wondering why the manufacturing operation didn’t use AOI techniques (or human inspection of samples) to prevent this from getting out of the factory. The loss of reputation seems to be a cost greater than the investment in AOI.